Real Madrid and Portugal star Cristiano Ronaldo is tonight celebrating collecting his second consecutive Ballon D'Or award. 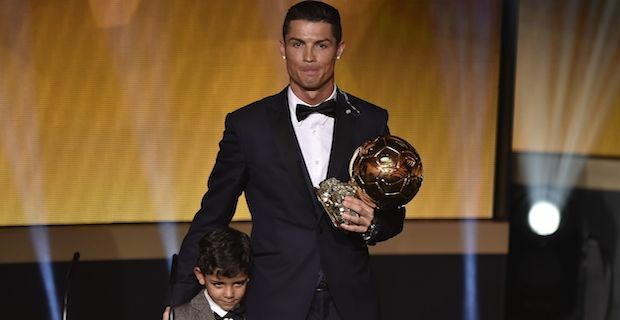 Ronaldo beat out Barcelona and Argentina rival Lionel Messi and Bayern Munich and Germany goalkeeper Manuel Neuer. The Portuguese striker has been named world player of the year now on three occasions. Upon accepting his award, Ronaldo said "I would like to thank all of those who voted for me, my president, my coach and Real Madrid. It has been an unforgettable year. To win this trophy at the end of it is something incredibly unique." World Cup winning coach Joachim Low was crowned the world's best men's coach after masterminding a comprehensive 2014 World Cup win for Germany. Women's Champions League winners Wolfsburg were well represented too with coach Ralf Kellermann named women's football coach of the year while midfielder Nadine Kessler was named women's player of the year. James Rodriguez was recognised on the night after winning the Puskas award for his outstanding goal against Uruguay in the World Cup finals. The Columbian beat out Robin Van Persie and Irishwoman Stephanie Roche, whose goal for Wexford Youths became an internet sensation and put her in contention to be the first female in history to win the Puskas award. Finalists Ronaldo, Messi and Neuer were all included in the team of the year. Neuer took his place between the sticks with a back four of Philipp Lahm, David Luiz, Thiago Silva and Sergio Ramos in front of him. In midfield Andres Iniesta, Toni Kroos and Angel Di Maria were chosen to support Ronaldo, Messi and Arjen Robben up front.